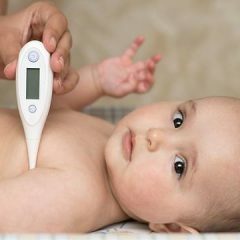 You will spot it rather easily - baby getting irritated easily, trouble sleeping at night, drooling (more than usual) and the most telltale sign? Baby trying to bite or chew on simply everything. Moms and dads, your baby is teething! This usually happen when baby's around 5 or 6 months, though teething time can vary for different babies. One thing in common though, is that babies get very cranky around this time. Aside from giving them lots of cuddles, here's one thing you can buy to soothe their pain - teething toys. 4. Why There Is No Such Thing As "The Best Teething Necklace"
Because this will be something your baby will be chewing and gnawing on all day long (at least during most of his/her waking hours), it is very important that the teethers you buy are 100% safe and non-toxic. You may think that all products designed to be teethers should be safe, but you will be very surprised at just how many products there are out there that do not meet the safety requirements. Try to avoid plastic teethers because they can contain harmful chemicals such as BPA and phthalates. Our review on the best teething products below fulfil all the safety requirements mentioned above, in addition, they are highly rated by parents and are inexpensive that everyone can definitely afford! Please note that the products below, despite the numberings, are not rated in chronological order. 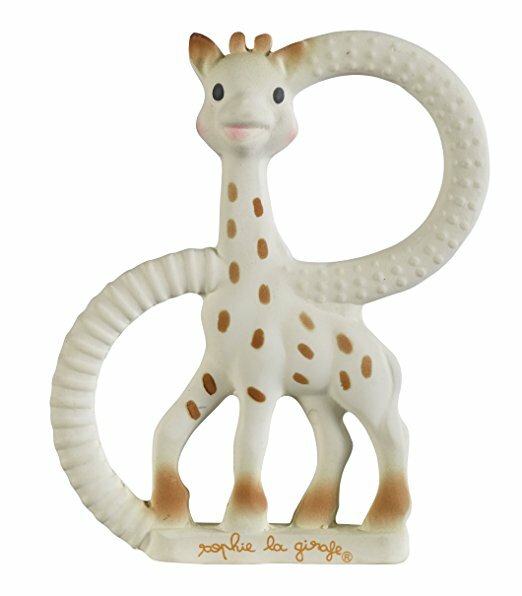 The king of teething toys, the Sophie la Girafe is perhaps one of the most famous teething chews for babies. A leader in the teething industry, the Sophie is very flexible and has various parts for baby to chew on such as ears, legs, and horns. 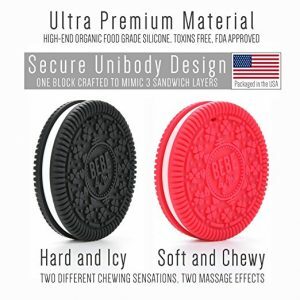 It is made of 100% natural rubber and food paint and is BPA and phthalates free so it is very safe for your baby. Apart from soothing baby's sore gums, Sophie the Giraffe stimulates baby's physiological and emotional senses - the contrasting spots stimulates baby's vision while the squeaky sound stimulates his hearing. Overall, Sophie the Giraffe is the best teether for 4 month old and beyond - it is the one essential item you should always have in your diaper bag! The Manhattan Toy Winkel Rattle and Teether is one of the best teething toys for babies - it is a toy, a rattle and a teether all in one! 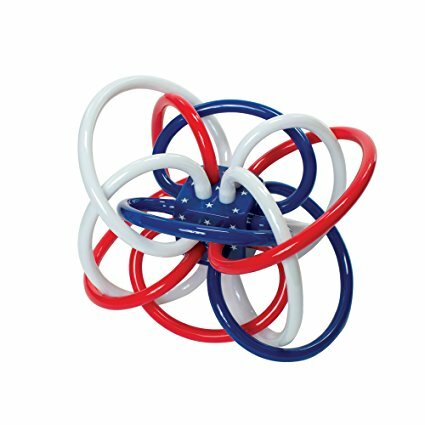 Featuring a mesmerizing loop design, the soft, pliable loops are BPA-free for your teething or gumming baby. For a more soothing effect, you can refrigerate it to soothe particularly sore baby gums and teeth. It is very lightweight which makes it very easy for baby to grab, hold and rattle. Like Sophie the Giraffe, the Winkel also stimulates baby's gross motor skills - the quiet rattle built in the center cube allows baby to explore the sound and cause and effect. Being a parents' favourite for over 25 years, you can be sure the patented Manhattan Toy Winkel Rattle and Teether is one of the best teether for molars! If your little one starts teething earlier than the usual 4- 6 months, then the Nuby IcyBite Keys Teether is the best infant teether for you. 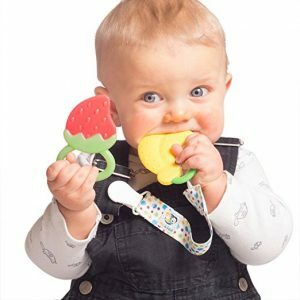 This is the best teether for 3 month old (and beyond) because it has an easy grip design that is ideal for those little hands to grab on which also helps with his/her coordination. 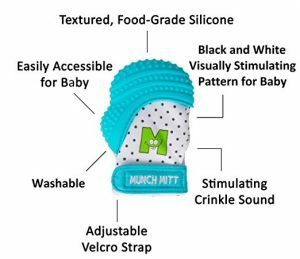 The multiple teething surface makes it perfect for baby to gnaw on, assisting in the eruption of front, middle and back teeth. If baby suffers a particular painful episode, the brand's PurIce technology provides gentle cooling on baby's gums if you refrigerate the teether for a while. This cool resilience surface stays colder longer than water-filled tethers, which is why it is one of the best cold teether in the market. We like how the Nuby IcyBite Keys Teether is both a toy that combines exercises for young hands, gums and teeth and is a visual stimulator to babies through its bright and colourful components. 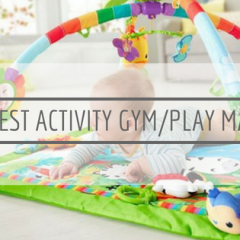 Definitely one of the best teething toys for 3 month old! Another best teether for 3 month old, the Safety 1st Mombella Ellie Elephant Teether is a favourite of many parents. If you prefer something 100% silicone-made, this is the best teether for you. Developed with the help of a paediatric specialist, it features an ingenious design that caters for different stages of teething. The raised texture on the top deals with vigorous gumming whereas the rest of the body is suitable for soothing emerging teeth. The loop in the middle makes it easy for little hands to hold and the bright colours and textures stimulate baby's visual and touch sensors. 100% BPA free, the Safety 1st Mombella Ellie Elephant Teether is dishwasher and freezer safe, too! The Little BamBAM Giraffe Teether from Bambeado (yes, another Giraffe teether) is one of the best teething toys for 3 month old and beyond. 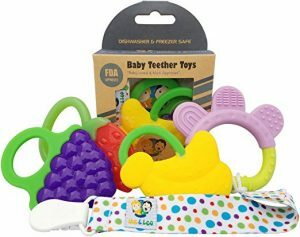 In fact, it understands that the teething period varies for different babies so its design caters up to two-year-olds, making it one of the very best teethers for toddlers. Unlike most teethers, the Little BamBAM is slightly bigger in size so that it is comfortable to hold even for toddlers. Don't worry about it being too big for your little one - the ergonomic design (as seen in the picture of the left) has different parts that are suitable for babies to chew on at different stage. The horns and feet are perfect for those chubby fingers to grip and the width ensures it won't be pushed too far into the mouth, making baby gag. In terms of chew-ability, the Little BamBAM strikes just the right balance - not too soft to the extent that it does nothing, nor is it too hard that it makes it extra painful for the little one to bite on. We also couldn't rave enough the seamless design whereby as a single, molded product, there is no joints or parts for bacteria to grow. Plus the fact that it is dishwasher, freezer and steriliser safe, you can always ensure it is hygienic and safe. As with all good teether for 3 month old and beyond, the Little BamBAM has all the bumps, ridges and colours to help stimulate baby. 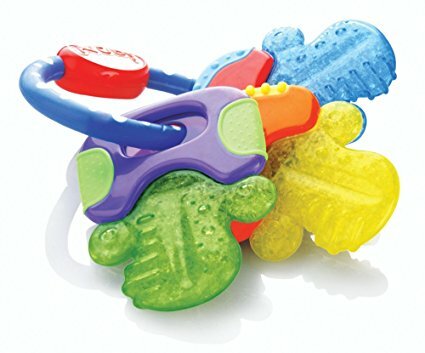 Just keep in mind that it may not be the best cold teether because whilst it can be frozen in the fridge, it is also made from 100% food-grade silicone, meaning you don't fill it with water so it will not be able to stay cold for long, unlike the Nuby IcyBite Keys or the Bright Starts Teether. Speaking of cold teethers, aside from the Nuby IceBite Keys, these ones from Bright Starts are another option you can consider if you are looking for tethers that stay cold and soothe for long periods. They are one of the best teething rings in the market. Comes in a pack of three, these are water-filled teethers that can be stored in the fridge for added relief. However, do remember not to fill it to the brim if refrigerating it because it may cause leakage when water expands. 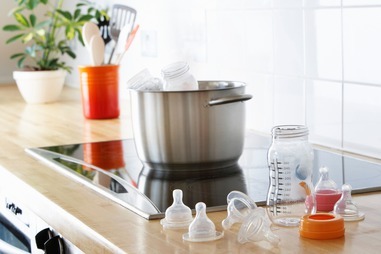 Even by itself, if you fill it with slightly cold water, it will be cooling enough to relieve baby's sore gums. 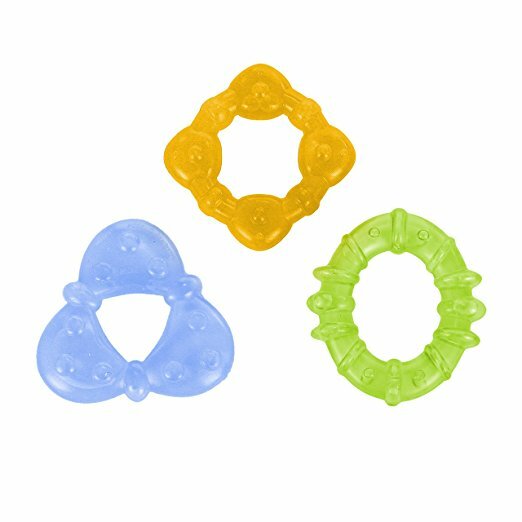 We like how each teether has different shapes, thereby giving baby different textures to chew on for different tooth or stages, or even mood! Made using safe and high quality materials, these Bright Starts Teethers are also one of the cheapest teether you can find in the market. 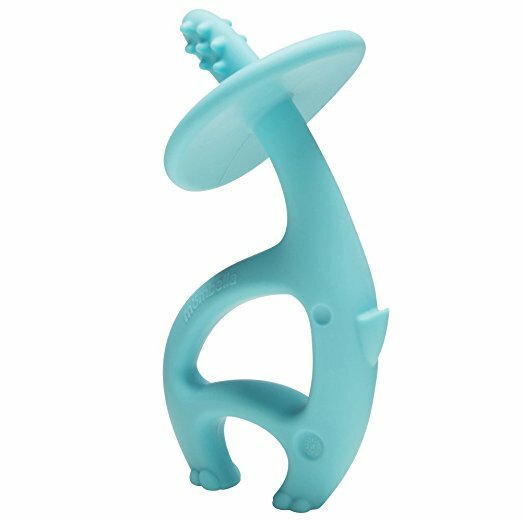 Here's another from the list of best teething toys for 4 month old and beyond - the Comotomo Silicone Baby Teether. Babies love to gnaw on their fingers when they are teething and this teether is designed to mimic just that - baby's little fingers. A loop is added to the top for baby's easy hold apart from providing another texture and shape so that baby can have multiple grabbing and biting points. 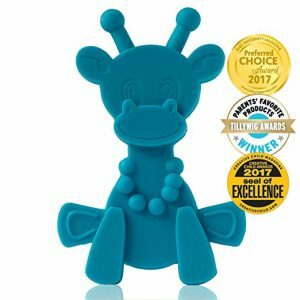 Made from 100% hygienic silicone, this teether is BPA, PVC and phthalate free and is suitable for all microwaves, dishwashers, boiling water and sterilisers for easy handling. If you want to deter baby from developing finger-sucking habit, you will not regret getting the Comotomo Silicone Baby Teether. No, these are not your favourite cookie - they sure do look like it, don't they? The oreos for your baby, the BEBE Cookie Teethers and Gum Massagers are one of the best teether for babies, and definitely one which employ such high quality material in their production. This teether comes in a pack of two with different textures and sensations - one is hard and icy while the other is soft and chewy. This provides the right relief for baby at different teething stage and don't think the flowers and ridges at the edge are just purely aesthetic - they actually provide different soothing effect as each flower and ridge has a different chewiness level. This is a design 100% exclusive to the brand itself and you will not find it elsewhere. Remember how we're saying they employ the best material? Yes, these teethers use the most expensive blend of high-end medical grade silicone that is used widely in labs and hospitals in Japan. And with that, these teethers are slightly more expensive than the common ones you find in the market, but still nothing too extravagant and we think it is worth the extra penny paid. 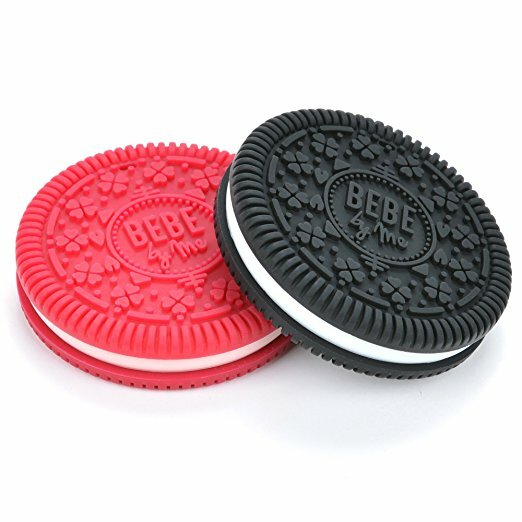 Although they are trademark protected with a patent pending, do note that there are many replicas of these BEBE Cookie Teethers and Gum Massagers (goes to show how popular they are) so make sure you check if they are authentic before you buy. Another one of the best teething toys is this one from Ike & Leo - whether you have a newborn, 2 month, 3 month or toddler, this teether set of 4 will soothe and massage even the fussiest and most uncomfortable teething baby. This is also another perfectly shaped teether that reaches all the way back to the molars but not too much to that it makes baby gag. The brand's signature Pacifier Clip is included so you do not have to worry about the teether accidentally reaching the floor and becoming dirty. Likewise, the Ike & Leo Teething Toys use certified and FDA-approved premium food-grade silicone that is BPA, PVC, phthalate and lead free so you can let baby use with peace of mind. 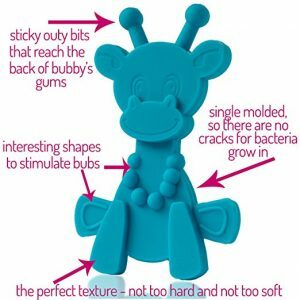 If you're ever unsatisfied with the products, the company is willing to do a full refund - it just shows how confident they are when they claim to be the best teething toys for babies! Last but not least, this - the Munch Mitt Malarkey Kids. 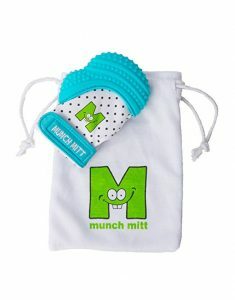 Not quite your usual kind of teether, this teeth and gum soother comes in a hand mitten form and is the perfect solution for babies who prefer to gnaw on their little fingers above everything else, teether toys included. This chemical-free and baby safe teether provides natural pain relief for teething babies who would otherwise chew on their little fingers. The soft, breathable fabric absorbs drool so you don't have to keep wiping them off baby, you know, baby's drools are excessive when he is teething! Mothers especially love how it can be chucked into the washer once the mitten needs cleaning - it cannot be easier than that! With the Munch Mitt Malarkey Kids, you no longer have to worry about your little one ingesting germs from chewing on his/her hand, or fearing that they may scratch themselves or saliva irritating their skin. Made with food-grade silicone and 100% BPA, PVC and phthalate free, this award winning self-soothing baby teether will last you years to be passed down to younger siblings in the future. Other than teething toys, you may wonder - is there any other teething items for babies, or, what's good for teething babies? The following are some of the best teething remedies for babies that work safely and effectively, especially in helping baby sleep easily at night when you don't want to keep him awake with teething toys. 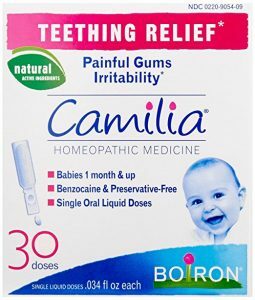 The Camilia from Boiron is hands down one of the best homeopathic remedies for teething babies. Not surprising there, considering how it is produced by the world leader in homeopathic medicines. These are teething drops for infants that temporarily relieve symptoms of teething (think painful gums and irritability) as well as minor digestive disorders that are sometimes associated with teething. They are one of the most natural remedies for teething babies, using only natural active ingredients in their sterile, single-use liquid doses (click here to find out what are the ingredients infused, and what are excluded) with no benzocaine (an ingredient that can cause dangerous side effects on young babies) present. It is the best teething relief for babies that are particularly irritated, or for parents that are looking for natural teething medicine for babies. Another best teething remedies parents rely on is teething gel for infants, and the Wink Naturals Cool Gums Teething Gel is the best teething gel to soothe those sore and painful gums. gently. All you need to do is apply a pea-sized amount onto baby's gum and massage gently and it will provide fast relief to your baby - a true gum soother for babies. Don't worry, it does not contain Benzocaine or Belladona, nor any numbing drugs. Free from preservatives, dyes, fragrances, added artificial flavourings and any unsafe ingredients of all kinds, this Wink Naturals Cool Gums Teething Gel is the best teething gel for infants of 2 months old and beyond to help them sleep better at bedtime. 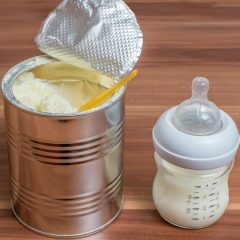 When baby is teething, s/he may reject even their most favourite baby food. 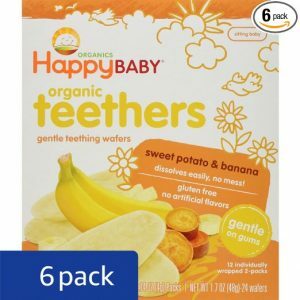 One of the good food for teething babies that we'd recommend is the Happy Baby Gentle Teethers Organic Teething Wafers, Banana and Sweet Potato (that is a mouthful, isn't it?). This is the perfect first snack for baby's developing gums because they dissolve easily so there's no pain and no mess. Made with jasmine rice flour and a blend of organic fruits and vegetables, they're healthy and will surely soothe and delight your little one's taste buds. Why we say it is one of the best food is because it is gluten free with no artificial flavourings or sweeteners, and there is no trans fat and high fructose syrup. With its packaging made without the use of BPA, this is truly one of the best natural teething remedies if you do not want to rely on medicine or drops. 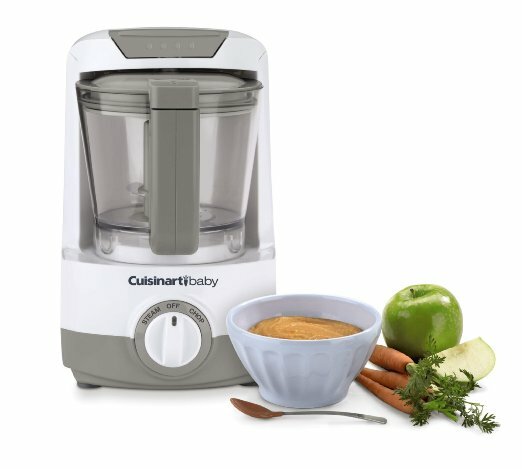 There are other flavours such as Blueberry and Purple Carrot, as well as Pea and Spinach so choose away! If all else fails, as in all the above recommended teething things for babies do not work to soothe your suffering little one, the next best thing for teething relief you can turn to is teething medicine for infants. If you're a parent, we're sure you're not unfamiliar with the medicines "Motrin" and "Tylenol" for infants. 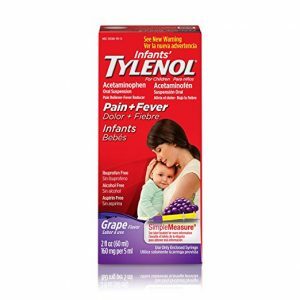 Yes, aside from being a fever reducer, you can use baby tylenol for teething too to relieve baby from toothache. Same goes for baby motrin for teething which contains ibuprofen that gives relief for up to 8 hours. If you're wondering which is the best medicine for teething between the two, there really is no one right answer. Some parents swear by tylenol for teething while others claim baby motrin is the best medicine for teething. Our best advice is to switch between the two so that baby do not get 'used' to either, and they should not be used regularly until really necessary. Oh and one more thing, do note that you have to seek your doctor's advice for the right dose for tylenol if your little one is below 2 years of age, whereas a chart of the right dosage according to weight/age is provided for motrin. In other ways, one may say Motrin is the best teething medicine for infants while Tylenol is the best teething medicine for toddlers. In any case, such teething medication for babies should only be your last resort if nothing else works. You may have come across many teething products that come in a necklace form so that it can be hung around your child's neck for easy access. While this is true in a way that you don't have to worry about teething toys falling to the ground thus coming in contact with germs and bacteria, the bigger picture, and more important issue is the potential choking and strangling hazards that come with it. This is not hard a concept to understand - even if you keep watch closely, there is still a chance that baby may choke on a loose bead (no matter how good quality the necklace is) or accidentally strangle him/herself with it when sleeping if God forbids, you forgot to remove it before putting your child to bed. It really is straight-up a dangerous item, and babies actually do die from it (SIDS). So the best solution is, even if many say it is the best thing for teething babies, AVOID TEETHING NECKLACE AT ALL COSTS! 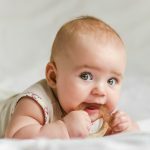 There are many teething remedies for 6 month old and beyond as recommended above that work wonders so it really isn't worth putting your baby through the risk of it.